The hibiscus flower is one of the most underrated flowers out there, but it’s got some seriously powerful stuff, especially when it comes to hair! 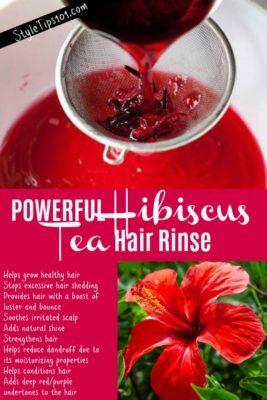 You’ve no doubt heard of hibiscus tea, and maybe even had some before, but have you actually ever thought out using hibiscus tea for your hair? Let us tell you it’s got some AMAZING benefits and will treat thinning hair giving it volume all while treating split ends, strengthening, and encouraging hair growth! 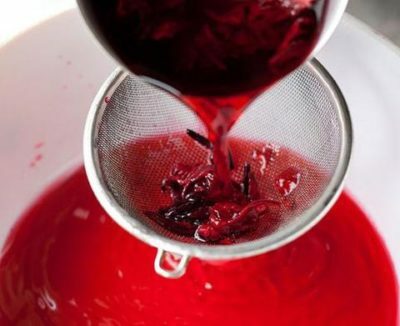 This DIY hibiscus tea rinse is super easy to make and you’ll fall in love with the smell immediately! Adds deep red/purple undertones to the hair * If you have light hair/blonde hair, please be wary of this! Boil hibiscus petals in water for about 5 minutes. Let cool to room temperature. Once cooled, add the rest of the ingredients and stir well. Strain the petals, and pour the mixture into a clean spray bottle. Spray directly onto dry hair focusing on roots and ends. Work through hair with fingertips, massaging the scalp gently for 1-2 minutes. Cover hair with a shower cap and leave on for 1-2 hours. Use as often as you would like, generally 2-3 times a week. Store the bottle in the fridge. It will last for a week or two, then discard and make a new batch.